Conventional wisdom tells us democracies are inherently stable and that the realities of electoral politics are such that democratically elected leaders can never enforce extreme agendas. But how true is this? Can democracy ever be used in the service of extremism? Perhaps we might find some answers in the world's largest democracy. India is famous for its economic miracle, its IT revolution and its colourful Bollywood culture. Australians are keen to do business with India, and many skilled migrants and overseas students from India are settling in Australia. The Rudd government even considered selling uranium to India, presuming its status as the world's biggest democracy makes its nuclear program less dangerous than that of Iran or Pakistan. Yet the plight of India's religious minorities has generally been overlooked by Australian governments and commentators. India's majority faith is Hinduism, an inherently pacifist and tolerant religion. Notwithstanding the caste system, Hindu societies have traditionally practised liturgical and doctrinal pluralism. 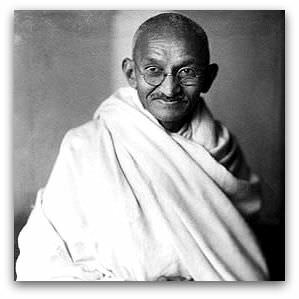 Mohandis Gandhi's basic philosophy of ahimsa (or non-violence) was influenced by Hinduism, while his struggle against apartheid during his early years as a lawyer in South Africa was inspired by verses of the Koran dealing with jihad (or striving for justice). Gandhi envisaged a truly civilised and democratic independent India which zealously protected its minorities. He fought both the British Raj and communal extremists who incited bloodshed between religious communities. His assassination occurred at the hands of extremists of his own Hindu faith. In recent decades, these forces have re-emerged in mainstream Indian politics. The spirit of Gandhi's assassins was present in the various social, educational and political organisations linked to the Bharatiya Janata Party (BJP), which ruled India federally from 1998 until 2004 and which continues to be the ruling party in various Indian state legislatures. In 2002, BJP activists in Gandhi's home state of Gujrat systematically murdered at least 2000 Muslim and Christian civilians and made 150,000 homeless. Police stood by and watched as these atrocities took place. State government workers carried lists of Muslim- and Christian-owned businesses and properties which were destroyed. The Gujrat Chief Minister, Narendra Modhi, praised the attackers. He remains Chief Minister. In recent times, there has been much discussion of the precarious position faced by Christians in Muslim-majority states such as Malaysia, Pakistan, Iraq and the Palestinian territories. Unfortunately, minority rights have become an issue of double standards. We rarely hear Australian Muslim religious bodies and lobbies talking about the plight of non-Muslim minorities in Muslim-majority states. Meanwhile, many Australian Christian religious groups seem to only address persecution of Christians when used as a wedge to marginalise local Muslims. Allegedly conservative self-styled groups like the Christian Democratic Party and the Australian Christian Lobby often agitate on behalf of persecuted Christians in the Middle East (except when Israel is involved) while ignoring instances of Christian and Muslim minorities suffering together. Hence the almost deafening silence over the events in Orissa and other Indian states, where activists of the Vishwa Hindu Parishad (VHP), a movement forming part of the BJP opposition, have terrorised Indian Catholic communities and institutions. The VHP regards Catholicism as a foreign faith, despite its presence in India for at least a millenium. Catholic welfare groups are accused of pressuring lower caste Hindus to convert to Christianity. The majority of Catholics are either former Dalits (untouchables) or from indigenous tribal groups. Recently, a senior VHP leader was murdered in the Eastern state of Orissa. Maoist rebels claimed responsibility. However, VHP leaders blamed Catholics. Over 40 churches and 11 other Christian institutions were destroyed by VHP supporters. One female missionary was burnt alive and dozens other Christians murdered. Tens of thousands of Christians continue to hide in jungles, hunted like animals by VHP thugs. Yet the silence among Australian Christians about the suffering of India's Christian communities is as deafening as the silence of Australian Muslims towards Muslims in Darfur. Even politicians claiming to champion Australia's Judeo-Christian heritage are silent about the Orissa massacre. There are 18 million Catholics in India, more than in Canada and England combined. Yet as Father Raymond de Souza lamented in a recent article for Canada's National Post, anti-Christian violence by VHP and BJP extremists 'cannot be checked if it is not even noticed'. But in case we sit triumphantly on our laurels and imagine such a state of affairs never happening in the West, we should remember that the Holocaust ended only 60 years ago and mass-graves are still being dug up in parts of Bosnia. Has the West learned its lesson on the dangers of democracies flirting with fascism? If recent election results in Austria and Switzerland are anything to go by, it seems not. Last October, a Swiss far-right party whose election posters featured white sheep kicking out black sheep gained a sizeable vote. Following recent elections, parties openly sympathising with Nazis could well form Austria's next government. Selective indignation on human rights abuses compromises not only our faith but our very humanity. In democracies, electorates choose governments who reflect their own attitudes. Fascism doesn't cease to be fascism just because it gains control at the ballot box. Just ask the Catholics of Orissa. This is a timely, well-written and balanced article. We cannot afford to be hypocrites. Nor is it helpful for exaggerations to be promulgated. According to the 2001 Indian Census, Muslims formed only 13.4% of the population (c. 140 million). Even if the figure of 200 million was correct (due to a general increase in the total population since 2001), Muslims still only represent a small minority within India. The point of this article for me was that, regardless of our ethnicity or religion, we cannot afford to have double standards and should speak out against injustice wherever it occurs. Two strange comments there. Of course ethnic cleansing of Hindus is evil, but that wasn't the subject of the article. Of course the Australian Government should make its views clear to the indian Government, speak up for the Christians in Orissa and other persecuted minorities in other parts of India. Again and again. We are reading daily about these atrocities in India and you are right, I don't think I have heard one single comment from our government or our Bishops? Hindus and Christians are living in peace for long time. There are as many christian schools in India as Hindu school. Do you know the reasons why things go wrong. Christians are trying to convert the poor of India.Hindus are not going to Christians to convert them to Hinduism. How long can people sit down and watch their own people converting? The indian muslims are creating a problem in India because of the conversion of hindus into muslims. Hinduism is much tolerant because it says every living being in the universe is one. They beleive in all the gods unlike believers in one god. Tell me now what is right. The silence has not been deafening . ABC Radio National had 10 minutes on the Orissa attacks on Christians (and not only Catholics) on 23/9, with an Australian expat listing large numbers of crimes in detail. Re conversions, Hindus have had millennia to remove the scandal of Dalit oppression.Perhaps the Untouchables recognise the superiority of love. Thanks, Yusuf, for your insightful comments. We are so caught up in events happening in the West that we do not notice what is happening in India. In response to this violence, Christians and Muslims may learn to cooperate in searching for a more Indian identity. Christians, Muslims and Hindus in Australia should join them in solidarity. That is what interreligious relations are about. Stop bugging! Do you think bragging by you Aussies going to affect us. This is Hindu awakening. Like it or not, the world has to bear with it. Gone are the days of ousiders' aggression on India. If you live in India, you have to respect Indian sentiments, which essentially is a Hindu country culturally. Churchians have to mend their ways. They should not indulge in soul-harvesting for a faith which is much discredited in West. It's a shocking news that Gandhi was inspired by Koran while he was practising law in South Africa ... striving for Justice. New concept and let it not fall into the ears of BJP. An article ridden with inaccuracies. Wish the author had done a little more research. The Gujarat riots were anti Muslim riots in response to the burning alive of Hindu pilgrims by a large group of Muslims, where did Christians come into this equation. It is incorrect to suggest that in the 2002 Gujarat riots the Christians were affected. They were Hindu-Muslim riots that erupted in the wake of the burning of the Hindus in a railway coach believed to be by the Muslims. Now the anti Christina violence in Orissa has its roots in the Hindu resentment against the religious conversions. This is not to justify the riots in either case but one must see them in proper perspective for an enlightened understanding and suitable solution. I suggest the author of this conjecture may like to read my book, Puppets of Faith: theory of communal strife that I shall mail to you if interested. This article is very true in every sense. From Muslims, to Sikhs, to Christians, virtually every minority group members have been killed by radical, facist hindu groups like the RSS, SHIV SENA, BJP. I can give examples, but they are already evident in history. I feel it is this right wing hatred and prejudice that is bringing terror to the cities of India in the form of revenge. The sadder part is that these hindu hardliners are never branded as terrorists as the law is often on their side. To date, they are not even on the terror watch list. However, if someone else from another religious group kills some Hindu, they brand them a terrorist right away. Such a sad situation for what is termed as the worlds largest democracy based on hypocrisy. dont forget the 5000 people which were BURNED alive and the BARBARI masjid which was destroyed and still not replaced till date. India is racist country - BELIEVE. The article reflects the common tendency amongst the Indian Muslims to keep the Islamic separatist cake and eat the Indian constitutional bread. Gay equality is a touchstone by which to measure politicians' moderate credentials. Turnbull's support is not totally altruistic: the inner-Sydney seat he represents has one of Australia's largest gay and lesbian populations.